The land on the coast of the North Sea is ripe with potential. Customize your farm by strategically selecting the best buildings to construct. Will your farm be strong enough to weather the oncoming storm in Lowlands? Pre-order your copy of Lowlands from our website or your local retailer to find out. 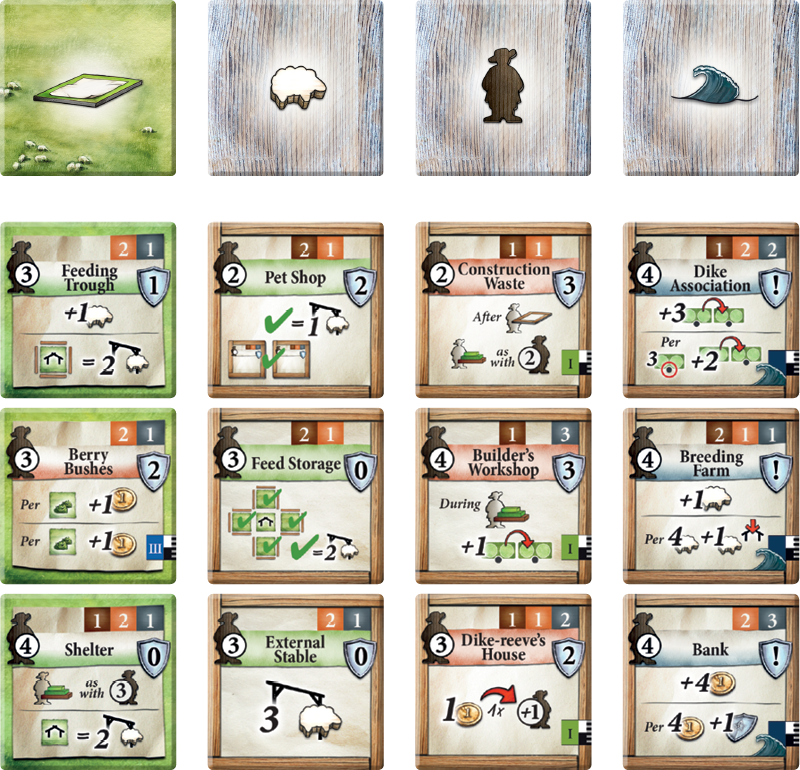 At the beginning of the game, shuffle each stack of the farm expansion tiles separately and lay them out in a grid by the main board. Draw three tiles each from the feature, sheep, and action stacks and place them faceup in the grid. Draw storm surge tiles equal to the number of players plus one. Each of these farm expansion tiles can be purchased during the game to upgrade and customize your farmland. The long, green grass waves back and forth in the wind. The sheep lazily graze across the field. The farmer pauses and looks into the distance, seeing the dark clouds slowly gathering over the coast. Preparations must be made for the oncoming storm. Feature tiles can be purchased and added to your farmland to change the landscape. Adding an orchard to your farm, for example, can net extra victory points when the storm surges if you have multiple spaces on your farmyard board showing trees outside pastures. The sheep farm tile will let you immediately take one sheep from the supply and add it to your farmyard. 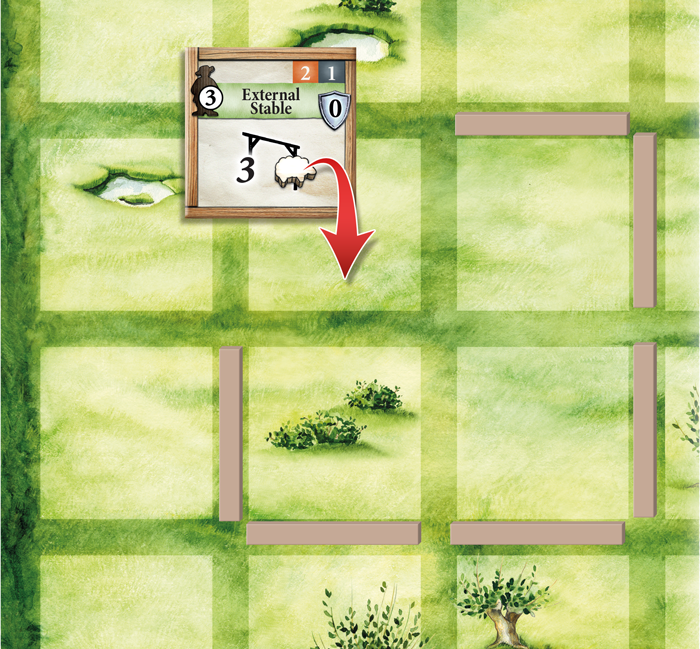 Every space with bushes that is contained inside a pasture will also give you five coins when the sheep farm tile is added to your board. Carefully customizing your farm can help you get ahead of the competition and prepare for the inevitable surge of the storm. The farmer wipes the sweat from his brow and grabs another nail to hammer into the wood. The rumbling thunder in the distance only makes him work faster to finish constructing the buildings on the farm. 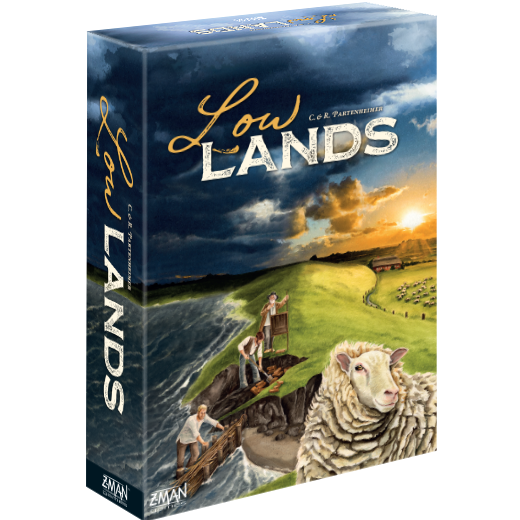 In Lowlands, players will be able to further customize their farmyard by purchasing Sheep, Action, or Storm Surge building tiles. When planning out your turn, make sure to pay attention to the action points and cost required to purchase a building tile. 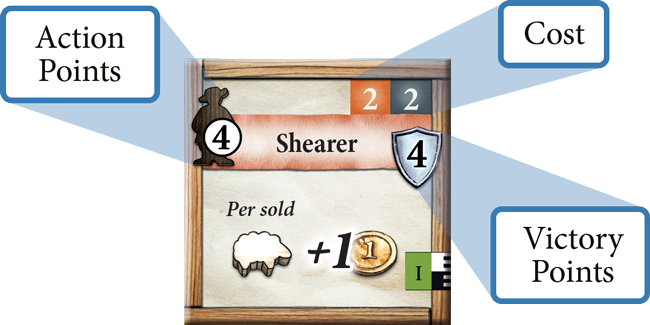 For example, the Shearer building tile requires the farmer with 4 actions points as well as two stone and two clay resource cards be used to purchase it. Once this building is purchased and added to your farmland it will give you an extra coin for each sheep sold, as well as four victory points. You can only add four buildings to your farm, so be strategic with your choices. Think carefully about your placement of the tile on your farmyard board as well. Buildings can play double duty, acting as a fence to enclose the edge of a pasture. How will you customize your farm? Pre-order your copy of Lowlands today and prepare your land to survive the oncoming storm.